Offering 24/7 Emergency Tree Service in Tyler, TX, we're no strangers to storms and the occasional tornado here in Tyler, are we? For homeowners, this can mean the removal of fallen or damaged trees. Fallen trees or large limbs can result in an eyesore at best and property damage or blocked paths at worst. Whether a tree is cracked or uprooted, customers want it removed as quickly as possible and without further damage to property or injury. At Tyler Tree Service, we strive to minimize the inconvenience caused by fallen timbers to our customers by being available any time for emergency tree cuttings or removals. Our arborists arrive prepared to remove fallen or damaged trees as quickly as possible with regard to safety and quality. With 25 years of experience in the field, we have the know-how to remove fallen trees without further damaging your home, car or any other property in the vicinity. Our employees come fully equipped to handle any situation that can arise as the result of a storm or tornado. We treat our workers like family and we make sure that they have all the proper safety equipment and training necessary to carry out these emergency jobs without any workplace hazards. Knock on wood, you may never have to deal with a tree that has fallen across your driveway, sidewalk. But it's good to know that Tyler Tree Service is fully prepared to take on these jobs and do them right, even if it means adjusting our regular schedule. As an honest and fair family-owned business, we will always keep our service rates competitive during these hard times and any other abnormal situations that can arise. There is a way to avoid the costs of having to schedule an emergency tree removal or cutting. By paying attention to the condition of the trees in your yard and having dead branches or dead trees removed before a storm causes its damage will greatly reduce the price a homeowner will spend on a removal. At Tyler Tree Service, we offer free diagnostics and quotes with no obligation to buy. Call now and have one of our arborists scheduled to come over and take a look at the condition of your trees. We have been in the industry for twenty five years now and our representatives are experienced enough to judge whether or not a tree or a branch will make it through another battery of wind gusts. Our tree surgeons are friendly, professional and are working at a time that is convenient for you. We serve the entire Tyler, TX community and the surrounding vicinity. Avoid hazards, injury and property damage by having problem areas in your yard taken care of at a much lower price than the cost of an emergency removal. 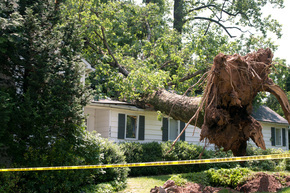 Give Tyler Tree Service a call before the next twister comes and hits you in the pocketbook.